Astate-of-the art approach to enhance the resolution of non-invasive medical diagnosis techniques is to utilize nano-size materials which are delivered at the regions of interest and allowimproved tissue contrast. For such applications, magnetic iron oxides are emerging as promising probes in the diagnosis of various diseases and especially in the area of magnetic resonance imaging (MRI).In view of this, a newly conducted investigation at the Institute of Electronic Structure and Laser (IESL), with Dr Alexandros Lappas as scientific coordinator, has discovered that functionalized cluster-like entities, composed of modified nanocrystals of magnetite (a common iron mineral), exhibit a remarkable up to four-times better contrast enhancement compared to commercially available products utilized in MR imaging methods (Scheme 1). Understanding the technological potential of the present discovery was possible by elucidating the physical properties of the titled materials and resulted in a granted patent application for IESL. The research was conducted in the frame of a fruitful collaboration between the coordinating IESL team and colleagues from other Greek (groups led by Dr K.N. Trohidou and Dr A.P. Douvalis) and Italian (Dr A. Lascialfari) R&D organizations. The partnership has demonstrated that the system is non-toxic and despite its sizable magnetization remains highly dispersible in aqueous media, while its advantageous MR behavior rests in the structural features. The latter are engineered in manner so that coupling amongst the interfaced nanocrystals is established. This work unveils the directed assembly of inorganic nanocrystals as a modular avenue for manufacturing shape-controlled structures with application-specific, collective physical properties. The discovered multifunctional material excels due to its inherent physico-chemical characteristics. However, being a member of the family of most common, technologically important iron-oxides, stands out also as a cost-efficient rival of commercial products. In practice, it performs so well that new frontiers in magnetically-driven image-guided early diagnosis and therapy are envisioned. 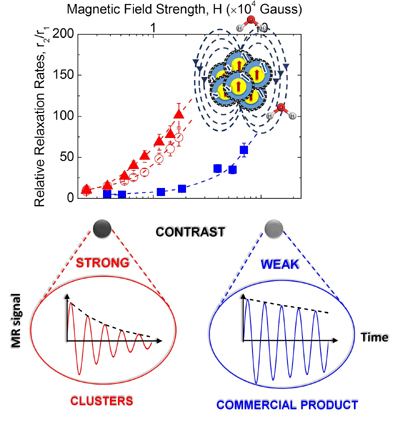 Scheme 1: Clusters (red symbols) enhance the contrast in MRI diagnostics.